It is one of the most versatile models among men shoes, able to make a classic dress easy and it perfectly matches with jeans. 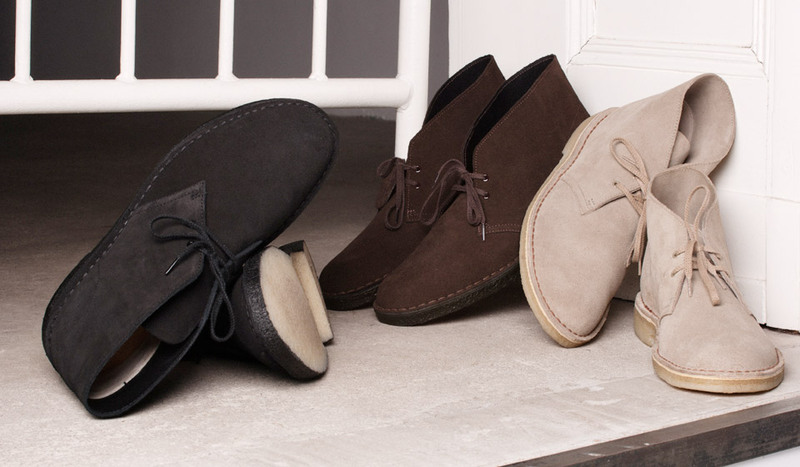 I’m talking about the Clarks , the desert boot par excellence. The company was founded in 1825 in the village of Street in England, with the production of leather slippers, but for the model that made the company famous all over the world we have to wait a few more years. It was during the World War II that one of the descendants of the Clark family noticed the shoes of an off-duty soldier who had fought in Egypt, describing it as a boot in suede and rubber sole. Shoes like these were worn also by merchants in the old bazaar of Cairo but they were a rough version. After the War, he returned to England and proposed this model to the family company that thought that they would have ever sold even a pair. Against all odds, this shoe made by a two quarters upper and sole with a rounded shape, appeared to be light and comfortable and had a huge success all over the world. The first to take the Clarks were the preppies in the United States of America and a few years later all Europe considered this boot as the ultimate “Made in England”. After going through the movements of the sixties and seventies, this shoe still collects acclaim from many men and its success seems destined not to stop, winning even younger generations. E’ uno dei modelli più versatili tra le calzature maschili, capace di sdrammatizzare un abito classico e sposarsi perfettamente con un jeans . 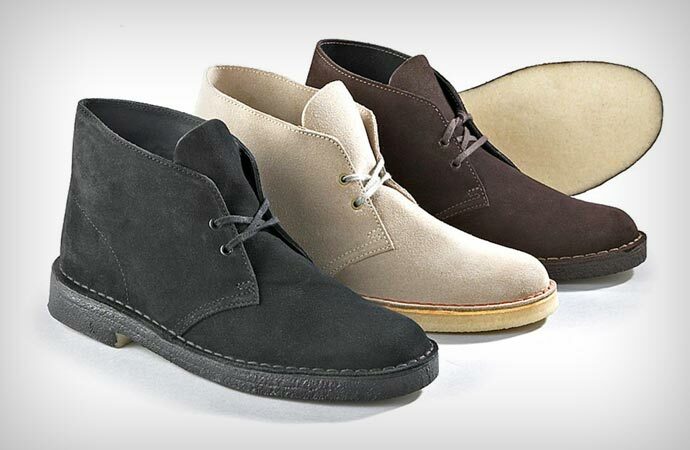 Sto parlando delle Clarks , il desert boot per eccellenza. L’azienda nasce nel 1825 nel villaggio di Street in Inghilterra, con la produzione di pantofole in pelle ma per il modello che li ha resi famosi in tutto il mondo bisogna attendere ancora qualche anno. Fu durante il periodo della Seconda Guerra Mondiale che uno dei discendenti della famiglia Clark notò la calzatura di un soldato fuori servizio che aveva combattuto in Egitto, definendola come uno scarponcino di pelle grezza scamosciata e suola in gomma. Scarpe simile venivano indossate anche dai mercati del vecchio Bazar del Cairo ma erano una versione più grezza. Finita la Guerra tornò in Inghilterra e propose questo modello all’azienda di famiglia i quali pensavano che non ne avrebbero mai venduto nemmeno un paio. Contro ogni aspettativa, questa scarpa formata dalla tomaia a due quartieri e dalla suola in para con forma arrotondata, risultava essere leggera e comoda ed ebbe un successo enorme in tutto il mondo. 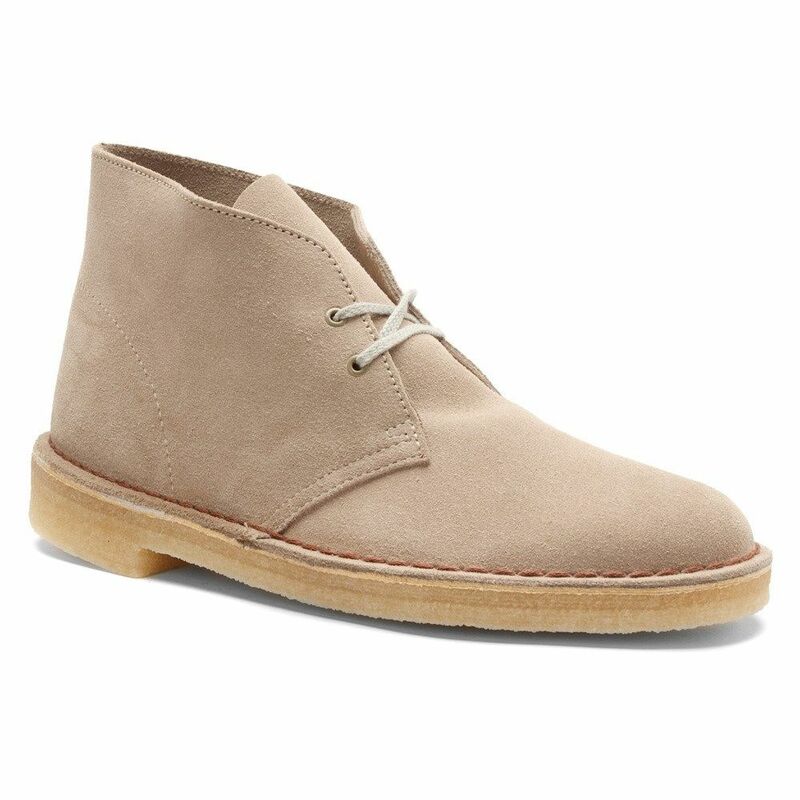 I primi ad adottare le Clarks furono i preppy degli Stati Uniti d’America e qualche anno dopo tutta l’Europa considerava questo stivaletto come il massimo del ” Made in England ” . Dopo aver attraversato i movimenti degli anni Sessanta e Settanta, ancora oggi questa scarpa raccoglie consensi da molti uomini ed il suo successo sembra destinato a non arrestarsi, conquistando anche le nuove generazioni.